and Jean-Yves Plu is Vice President, Digital Eco-system. Hamilton looks after implementing a Group transverse Digital initiative called Business Innovation & Growth (BIG), and lead Digital Transformation in Marketing to drive enhanced customer engagement and understanding, while building a modern Thales’s Marketing Network. As Head of Operations, Stéphane handles support functions, and the process of MVP selection / design center, engineering and delivery of the innovative service, and transfer to business unit. Jean-Yves looks over incubation and acceleration of internal and external startups at Station F on cybersecurity topics, and monitors the Digital Academy (transformation program including culture, business, management, and marketing), addressing all employees, through customized journeys with the Thales Learning Hub. Thales Digital Factory started in 2017, with 4 people, and grows at the speed of light, reaching a staff of 230 people, committed to the achievement of 24 MVPs, and now dispatched over 3 work spaces: WeWork Paris. WeWork Singapore, ans CortAIx in Montreal. Let’s go through some key attributes of this venture. Digital transformation at Thales involves digital offers, and digital ways of working, with Ux (User Experience) at the center. Oliver Flous leads the 2 activities, as VP, Digital Transformation & Digital Factory. The challenge is to achieve a fine product, with a more agile way of working, and in line with TTM (Time To Market). There is a symmetry of attentions to create new offers and to think product differently,: it involves a new mindset, starting from customers’ problems, and introducing technology as a solution to a problem. In a nutshell: revisiting what we do, and how we do it! Transformation impacts managers as well, in order to find the fit between their know-how, and the determination of young employees. Digital transformation unfolds new ways of innovating, including idea challenges, 3 months pre-incubation ending with selection for incubation, business orientation, organization in squads, transversal work platforms, and transformational resource streams: Ux design, culture, technologies, data, digital workplace, and cybersecurity. Design skills are integrated from the start into the digital projects. Resources come from various regions: Paris, Bordeaux, Toulouse. They have changed their focus toward Design Thinking approach. And at each stage, to CoDesign with customers, for instance, facilitating workshop with customers invited by a business line, organizing work sessions with Thales customers and end-users; a workshop was thus set-up on the Free-Economy. Let’s now dig-in into the heart of the Factory. 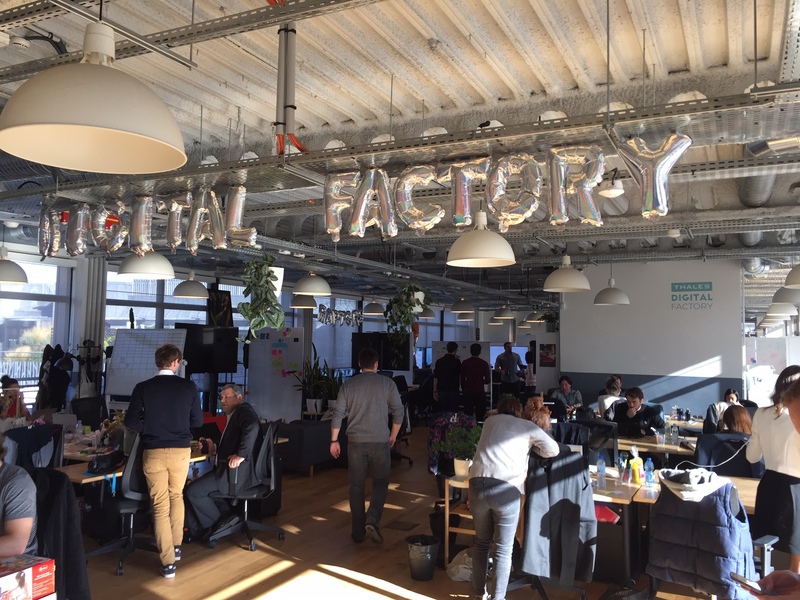 The Factory accelerates the Digital Transformation, by co-selecting innovation opportunities with the business lines, framing them, building MVPs, iterating, and refining along until the final transfer to the business line. Innovation scope tackles new businesses, as well as “re-platform” existing service, and grow the core business, leveraging digital. New growth projects might as well transition outside of business units. MVPs are structured in cycle of 8 sprints going over 4 months; 60% of the projects ask for a second cycle to refine the MVP, or complete the hand-over; MVP is business case oriented to test the business line commitment; this framework is designed for acceleration, with a 4 months deadline triggering a positive tension. Staffing is localized at the Digital Factory, using internal (115) and external resources (115) provided by Accenture. Product owners and technical skills are provided by the business line: this technical know-how is cornerstone in Thales BtoB business. Squads are autonomous. The dream team composition is a paramount factor for success, as innovative projects are very much tailor-made (at the opposite of a product culture, where the same piece is sold to millions of customers). The Digital Platform made of a CI/CD chain, Data Lake and Security building blocks is based on Microsoft Azure Cloud and Pivotal Cloud Foundry. This platform is a key enabler for MVP development and product re-platforming insuring delivery speed, product security, and new business model introduction. A Digital Manifesto illustrates the culture of the Factory, it stresses on the following values: empowerment (over control), data driven (over opinions), test & learn (over plan), collaboration (over protection), user (over customer), tolerance to failure (over not trying), and key qualities: hungry, humble, aware. Raphaël has also set-up startups week-ends called MakeItUp for Thales, and has since turned entrepreneur, creating his agency with 3 cofounders, CreateRocks, to support corporates in intrapreneurship, and transformation programs, leveraging human capital with methods, and a digital app, Makerz. If you’re a starting intrapreneur, I strongly recommed you subscribe to his newsletter Learnerz, who will guide you stet by step over several weeks. Let long live innovation at the Factory! Merci Nicolas pour cet article ! Merci de m’avoir reçu et bravo pour ce que vous faites !